We’ve been searching for sturdy, shade loving-plants for our London garden, and where better to look than among the flora of North Amercia. 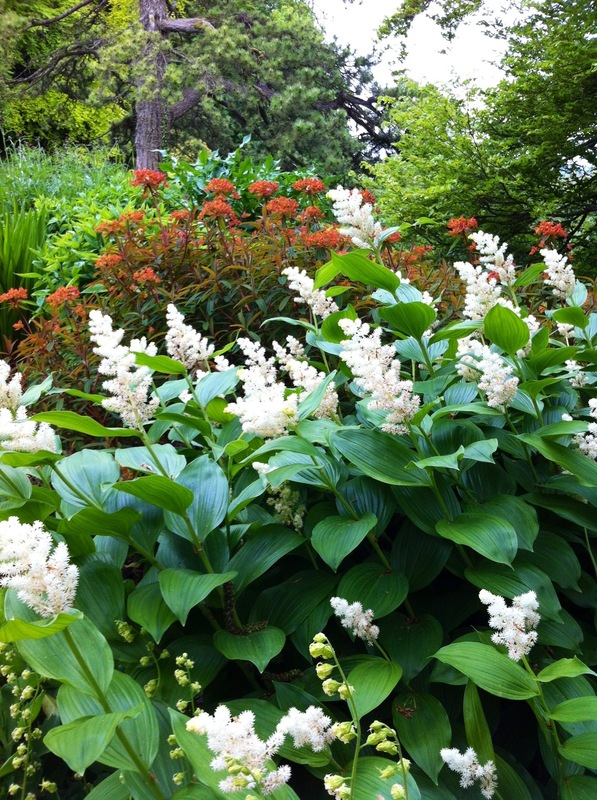 Smilacina racemosa, the false Solomon’s seal, is a clump-forming perennial which produces fluffy plumes of creamy white flowers in spring. The flowers are followed by yellowish-green berries which turn to deep red in autumn. I love the plant association, shown here, with Euphorbia grifitthii ‘Fireglow’ – something I’ll be trying at home. Lovely combination! Looks great in the fall, bending a bit under the weight of the red berries. Something to look forward to after the flowers fade! I have just planted one of these out in the garden and now realise that perhaps it is a little too close to the front! I saw a wonderful clump of maianthemum at Rosemoor recently, which I think may serve a similar purpose. It is now on the Lust List! Yes, not sure which of Maianthemum or Smilacina is the more correct name? There seems to be very little agreement on t’Internet. Oh is it the same thing? I am being dim again? Manzanilla is the sherry 😉 dry and nice with olives or smoked almonds. Which reminds me I must leave the office and get home for a drink. It’s been one of those days.